Maximum juice and minimum preparation required with the 3" feed chute. Easy assembly and clean design that can be washed on the top shelf of the dishwasher. The dual speed motor spins the filter basket at 12,000 RPM for hard fruits and vegetables. Low speed is optimal for softer fruits and leafy greens such as cantaloupe and spinach. 3" Extra-wide Chute processes whole fruits and vegetables without precutting. Makes an 8 oz glass of juice in 5 seconds using whole apples. MSRP $199 Based on the Manufacturer's Suggested Retail Price, this juicer is priced about average. 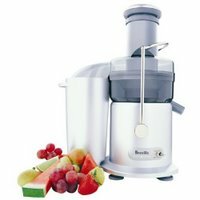 Star Rating 4.4 User reviews, ratings, and feedback indicates that this juicer is rated higher than average by 273 users and ranks in the top 29% of juicers.